Welcome to the world’s first mobile-first newsroom. 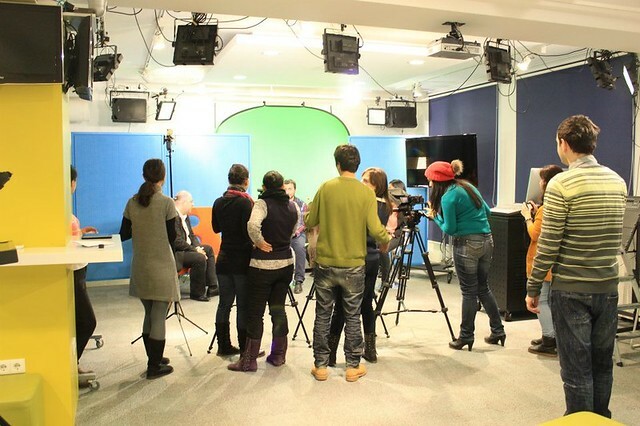 Built for the mobile generation, IREX’s Mobile Multimedia Education Center in Tbilisi is a multipurpose, multimedia journalism studio and learning space that embraces mobile media and innovation in journalism. 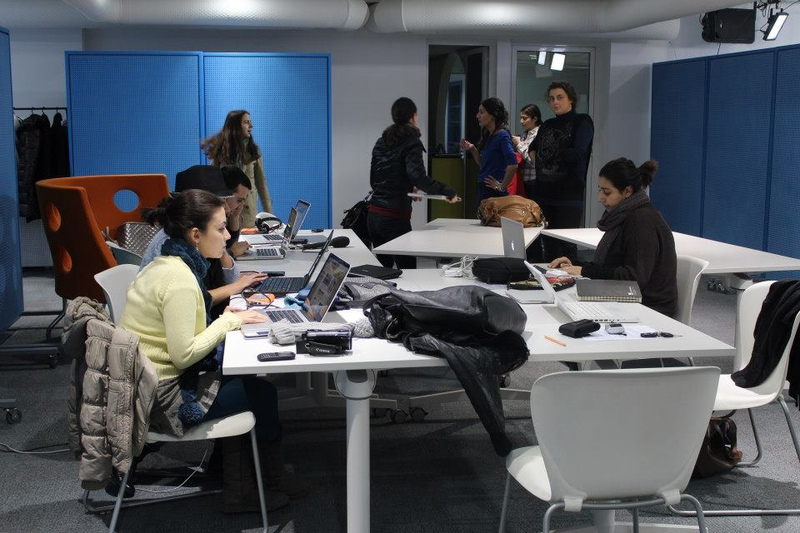 The S.M.A.R.T Media lab project in Tbilisi, Georgia was designed from the ground up to embrace the mobile lifestyle and mobile reporting methods. All of the multimedia gear is organized in three tiers, mobile kits with small cameras, intermediate kits for advanced courses and pro kits for documentary and broadcast work. The studios and training concept serves a graduate-level journalism school and a Radio Free Europe diploma program. The S.M.A.R.T. concept introduced a comprehensive mobile-centric media production model and a radical approach to open floor plan design for studio/classroom facilities. I was lucky to be involved in all phases of launching a new journalism training center for IREX in Tbilisi, Georgia and it has been a remarkable journey. I was fortunate to share this experience with some truly creative partners and now I can tell you what we learned when designing and building the world’s first S.M.A.R.T. Media Lab. Funded by a grant from USAID, the world’s first S.M.A.R.T. Media Lab was designed from the ground up to train the next generation of multimedia journalists for Georgia and the south caucuses. The G-Media program was formed as a four-year project to support independent journalism efforts in Georgian society. The Multimedia Educational Center is a fun and colorful studio and learning space that was cleverly designed to be practical, digital savvy and affordable. It takes time to develop all the expertise you need to be able to rehab an existing space, define the technology needs and solutions, as well as navigate the world of government regulations. And it takes time to convince technocrats, educators and journalists that it is within their power and in their best-interest to make a project like this original, imaginative and practical. I got involved in late 2010, when there was a request from IREX to explore ideas to build a simple media lab for a Georgian journalism school and a local broadcaster who wanted to offer training. Some prospective locations were reviewed, personal came and went and we pitched up other potential funding partners. In early 2011, I authored a set of S.M.A.R.T. newsroom concepts that explored the central ideas for a radical new design concept for a journalism school and pitched it to my IREX bosses and the training partners they are supporting with this media development effort. You rarely get chances to do profoundly imaginative work in the media development world, but with this project, I recognized this as a golden opportunity to put all the best ideas I had been collecting into play. I am glad that my scribbles, presentations, photos, visual research and enthusiasm somehow persuaded the chiefs to take a chance on something that had not been done before. colorful graphics for the entrance of the center. S.M.A.R.T. was scribbled into my notebook and would serve as an acronym for the values assigned to serve users who will occupy the facility: Scalable, Multi-purpose, Asymmetrical, Resourceful and Trusted. I used the S.M.A.R.T. 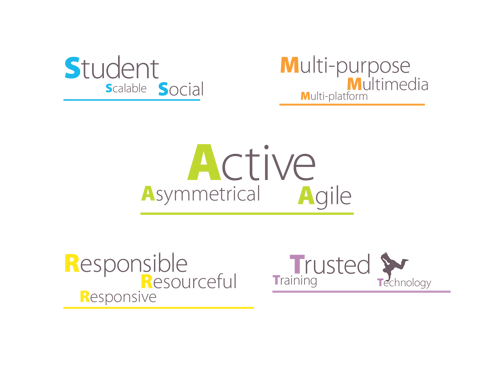 acronym as a tool to organize and refine goals. The S.M.A.R.T. Media Lab features state-of-the-art thinking about electronic classrooms, studio design, open space architecture, and mobile-oriented media labs. We were being really ambitious in our ideas of what could be done in small space and this meant designing a great user experience for students and teachers would be the focus. I worked with the G-MEDIA team to quickly hire an architect who could give us professional renderings, and take these ideas further. 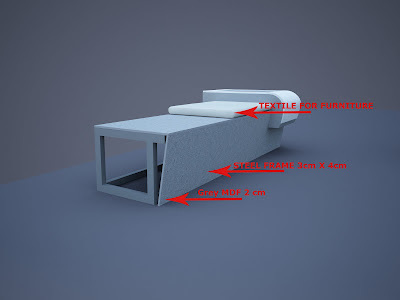 Architect’s renderings can give structure to your concepts. I spend a lot of time building catalogs of visual research about furniture, lighting, surfaces, soundproofing, etc. and I shared the best of these with Girogi Mosulishvili, the architect. Girogi and his partner then brought these samples to life. His renderings were photo-realistic and stunning and were widely used to market the center we were going to build. These early renderings from the architect showed that he understood what we were going for and the drawings helped us show funders what they were paying for. 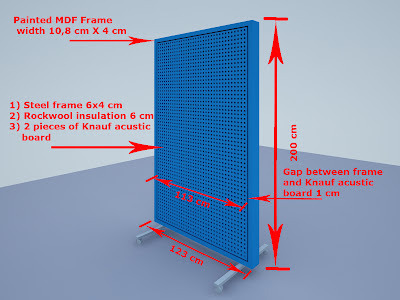 We worked with Georgian craftsman to construct our innovative sound-proofed moving walls. We also asked them to build the study benches we had designed for students using mobile devices. 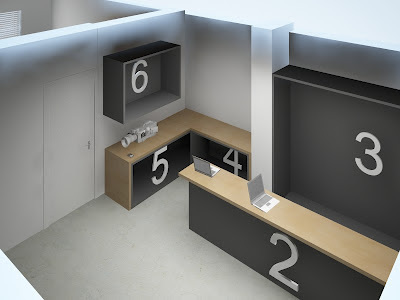 We designed a secure locker storage and engineering bay to support our ideas for a robust, but simple check-in, check-out system for students. I asked my colleagues to join me in this leap of faith and they eagerly contributed to expanding expectations for what our model for journalism training could be. I challenged them to help me design a high-tech journalism training lab as a venue where interesting things are always happening. They were excited to be able to teach new media in a friendly space with open architecture, mobile-oriented media labs and smart uses of technology and materials. These concepts attracted high interest from our partner schools: the Georgian Institute for Public Affairs (GIPA) and Radio Free Europe/Radio Liberty, as well as from Ilia State University. 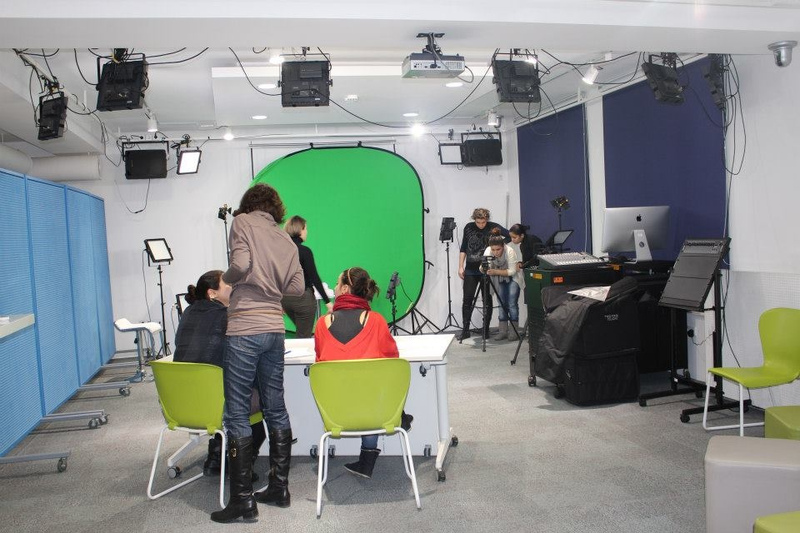 Some of the stars: The Prime Camera, the mobile TV studio for livestreaming and TV production and the smart panels that can be used by instructors students as needs change through the day. After we got our big concepts out on paper and approved by the bosses, I then spent a lot of time researching and specifying every piece of electronic gear and studio equipment. I was obsessed about finding gear that works reliably, has great ease of use, and provides professional results. I had a small budget and wanted to make as many of the different reporting pieces of kit fit together so in order to make it easy for teacher and students to mix and match mics, cameras, lights and computers. To pre-solve as many IT problems as possible and to make things completely uniform, I specced Apple for all computing technology, Adobe for the key software and pro mics and pro audio interfaces for all levels of gear. I designed a system of lab kits that had everything needed inside (mics, cables, adapters, cards) and all kits include a case. I also established what the video standards would be and devoted extra attention to some of the special pieces – like the prime TV studio camera and documentary film kits. TV cameras are really complex systems and require a lot of prep and set-up, trial and error and testing before the engineering solution is finalized. We partnered with a local video vendor to help us with the on-site engineering tasks and equipment ordering. The grand opening event was designed to test every system and procedure and learn from the experience. The first event for the center tested all of our concepts and technology to the limit. Over 100 people attended and we had to manage multiple speeches, video projection, wireless mics, translation booths, food service at the cafe, livestreaming from multiple cameras, hosting of other broadcasters’ TV camera crews, security, ventilation, wi-fi as well as private tours for diplomats. And, thanks to the great G-Media team, we de-bugged every major problem. Today the students and instructors are using the very latest media tools to teach and produce professional TV shows, documentary films, as well as create top-notch print and online products. Students learn and practice TV news show production almost every day at the S.M.A.R.T. Media Lab. The MEC training center and media studio are designed to meet the rapidly changing needs in journalism education and news gathering. This unique facility is equal parts laboratory, studio and forum, and offers an immersive learning environment for journalism students. Informal meeting spaces double as impromptu filming locations because the furniture is beautiful, sturdy, lightweight,and everything is sound treated and lit evenly. The center’s unique structure allows educators to take students out of classrooms and into a studio environment which challenges many traditional solutions about how to organize classrooms, computer labs, studio and editing space, meeting rooms, technology, security, sound control, lighting and other aspects of a multimedia newsroom. Need a classroom in five minutes? No problem. 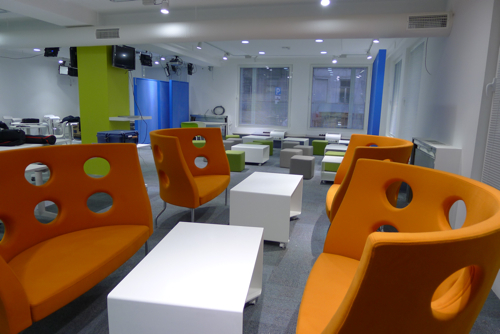 Students are adept at moving walls, chairs and tables around several times per day to get maximum use of the space. The entire space functions as a large multi-platform stage where every square meter provides a studio-grade environment available for interviewing, editing, producing and hosting multi-platform content. The classrooms at the MEC are all digital-ready: All rooms feature high-bandwidth wireless service and digital projectors. Student workstations are made up of Macbook Pros with the complete Adobe Master Collection of professional media software included. In addition, students have access to a wide range of quality cameras, microphones, audio recorders, iPads, and other mobile devices. Video editing suite with iMacs where students can cut their longer-format film projects. The S.M.A.R.T. Media Lab can also be used as a live event space for lectures, movie screenings, conferences, workshops or political debates. The lab’s design also provides broadcast-quality live streaming of video from these events. It is these outside activities that will generate the revenues needed to keep the center operating as well provide a stream of interesting intersections to keep the students and faculty refreshed.